We hadn't been to Galveston since before Hurricane Ike. Given that another hurricane season is upon us and the BP oil spill is threatening to change life around the Gulf forever, we decided not to wait any longer to make another visit to Galveston. After the jump, our trip to Houston and Galveston over the Memorial Day weekend. 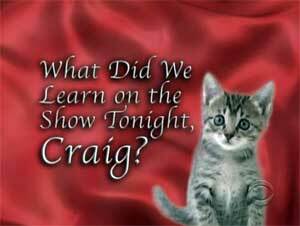 Each night, at the end of "The Late Late Show," there's a little jingle that asks host Craig Ferguson, "What did we learn on the show tonight, Craig?" And Craig, with his feet up on his desk and his coiled-snake coffee cup in hand, reviews the lessons learned. After the jump, "What did we learn on the blogs this week, Mark?" Suppose the city of Richardson told you that they were interested in redevelopment of a strip of older apartments, aging underperforming retail, and miscellaneous other land uses, and asked you to participate in a survey. You would rate the attractiveness of a series of photographs of potential new development for the area. For example, what would be your reaction to the photo above? Probably not much different than the reaction of almost everyone who actually participated in this focus group. 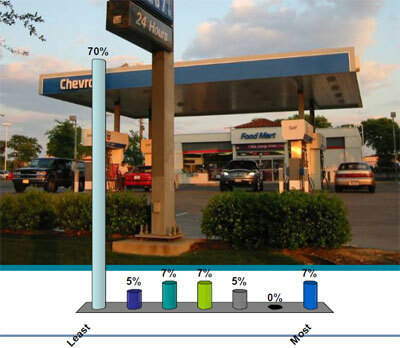 The overlaid bar graph indicates that almost everyone who actually did this exercise gave this Chevron gas station the lowest rating, a 1 on a scale of 1-7. After the jump, why their opinion may not matter. Is It Too Late To Stop The Nonsense? The Texas State Board of Education (SBOE) finished revising social studies standards for Texas public education for the next decade. After this rewrite of history by these elected non-historians, Texas schoolchildren are now going to be taught that maybe Thomas Jefferson was factually incorrect when he described the First Amendment as "building a wall of separation between church and state," that Abraham Lincoln's Gettysburg Address needs to be balanced by the speeches of Jefferson Davis, and that Wisconsin Senator Joseph McCarthy, who found a red under every bed, didn't have much to be ashamed of after all. Our children will have to endure a decade of this. Or will they? After the jump, is it too late to stop the nonsense? Are you surprised that a focus group says they prefer quality? No? Neither am I. The Richardson City Council acted as if this is some big discovery. At the May 24 City Council meeting, city staff presented a progress report on the West Spring Valley Corridor Reinvestment Strategy, specifically a report on the second community meeting that was held May 13, 2010. My take on the progress report of the first community meeting can be found here. After the jump, my review of the second community meeting. The Health Department of the City of Richardson conducts inspections of restaurants on a regular basis. The department publishes the results for all to see. According to the city, "Scores are based on a scale of zero to 100. A score of 90 to 100 is excellent; 80 to 89 is good; 70 to 79 is acceptable; and 60 to 69 is marginal." According to the latest ratings, all of the restaurants in Richardson are acceptable or better. Most are good or even excellent. Dozens achieved a perfect 100 score. After the jump, a list of under achievers. Three of the Richardson ISD high school baseball teams achieved their season goal to make the UIL state playoffs and "Play in May." Berkner and Richardson made it to the second round (Area). Saturday, the Lake Highlands Wildcats baseball team lost 5-1 to Belton High School in the third round (Regional Quarterfinal), bringing an end to this year's great season for the RISD team that made it deepest into the playoffs. The player of the game was Belton's Shane Hoelscher, whose home run, double, single and three RBIs provided all the firepower Belton needed to advance to the Regional Semifinal round next weekend against the winner of the Klein Collins - Spring series. By the way, Hoelscher is committed to playing for Rice University next year. Go Owls! For more photos of today's game (and a look back at other games this season), look here. Pete Sessions' NRCC "Needs Proctology Exam"
Tuesday was election day in a few states, not Texas, but one story has a north Texas connection. Besides the primary elections, there was a special election in Pennsylvania's 12th District to fill the Congressional seat left vacant by the death of Congressman John Murtha. The head of the National Republican Congressional Committee (NRCC), which oversees GOP electoral strategy nationally, is none other than Richardson's own Congressman Pete Sessions. After the jump, what our Congressman has been up to outside his district. "Plano and Richardson are positioning themselves to become transit hubs, connecting the DART Red Line with the proposed Cotton Belt commuter rail. Both city councils have recently approved resolutions that, while effusive in their support of the Cotton Belt, are markedly different in the route they want the new line to take." After the jump, figuring the odds for this prize fight. "Raccoons eat tomatoes. Don't let anyone tell you they don't. Their little stealing paws nabbed the best looking ones. They were not even red, still green." Almost Haiku prose, that, if there were such a form. Or free verse, at least. Let's see how it looks reformatted. Don't let anyone tell you they don't. Their little stealing paws nabbed the best looking ones. They were not even red, still green." The blog is also worth checking out because Maggie May USA had the scoop that, during Wildflower!, "hotel rooms, in addition to the suites, at the Renaissance Hotel have started being booked up by the City of Richardson" and "customers of the hotel who have reservations are bumped." That's not nice. Does Texas Open Meetings Act Need Improvement? Recently I've commented on the unintended negative consequences of the largely beneficial Texas Open Meetings Act. (For example, here, here, and here). The act requires that local governments, e.g., the Richardson City Council, post agendas for meetings in advance. Consequently, it forbids them from discussing issues raised by visitors, at least during that session. I complained that legitimate issues raised by visitors end up getting swept under the rug. After the jump, one reader takes my criticism to task. Neighborhood Protection Alliance. The name might conjure up some kind of organized crime protection racket. Or maybe a vigilante group. The reality is not bad news, but the very existence of such a group indicates that all is not well in Smallville, USA Richardson. After the jump, what the Neighborhood Protection Alliance means for Richardson. "Coterie" is an organization of Richardson-area friends who get together three times a year for dinner and entertainment. The theme and activity for each occasion varies. The May 2010 Coterie party's theme was "Coterie Games." For a slide show of festivities, click here. "28 Square is your one stop blog for everything Richardson. Sure, we’re all a little bit biased here but the good news is with 8 different viewpoints you’re bound to learn something new about the city you call home. So bookmark us, read us, argue with us and finally agree with us (because just ask our loved ones, we’re always right) and be ready to discover something new within these 28 square miles of Richardson. Check it out: 28 Square. My earlier disappointments are spelled out here and here. After the jump, today's lesson. The City of Richardson supports the arts. Kinda. Sometimes. Wildflower! Arts and Music Festival opens Friday night in Richardson's Galatyn Park. There will be thousands of music fans attending concerts by the likes of the B-52s and American Idol finalist Casey Jones. This is a big effin' deal, to coin a phrase. It promises more than it delivers. The Texas Open Meetings Act is one of those good intentions that doesn't work out as well in practice. In the words of the Texas Attorney General, "The Texas Open Meetings Act honors the principle that government at all levels in this state should operate in a way that is open and accessible to the people." In practice, a lot of things still happen behind the curtains. After the jump, news about Richardson's Lookout Drive Transfer Station. The Texas Open Meetings Act is one of those good intentions that doesn't work out as well in practice. In the words of the Texas Attorney General, "The Texas Open Meetings Act honors the principle that government at all levels in this state should operate in a way that is open and accessible to the people." In practice, the Texas Open Meetings Act sometimes does just the opposite. After the jump, the transcript from the May 10 Richardson City Council meeting. On May 8, Richardson voters approved four bond proposals totalling $66 million. The proposals all passed by comfortable margins, but smaller than any Richardson bond election in memory. There are different explanations for the smaller than usual margins, from growing resistance to tax increases in general, to the tough economy in particular, to a protest against perceived failings of city staff and city council, to doubts about some of the projects themselves. I voted for the bonds, but that doesn't mean I don't still have a few reservations myself. After the jump, my top three issues remaining as the smoke of the election campaigning clears. It was Mother's Day. How better to spend the day than wandering Dallas' Fair Park at the CityArts Festival? The annual event showcases cultural, performing, visual and culinary arts. There are over 200 artists who exhibit (and sell) their fine art. There are cooking demonstrations and samplings. There's music at any of several stages. And there are enough food concessions to get you stuffed and keep you that way all day. It was our first time to see the "dancing water" show choreographed to music at the Esplanade Fountain. It's not the Bellagio fountain show in Las Vegas, but what is? On the negative side, the weather wasn't the best -- overcast and cool and breezy. But if the crowds stayed away, so did the rain. A good time was had by all. Laura Maczka was elected mayor. RISD will have a runoff election between Rachel Chumney and Lanet Greenhaw. To anyone landing here looking for election results from the June 15, 2013, RISD run-off election, look here. 2010 results are after the break. All 4 Richardson bond proposals pass by about 4-3 margins. Voters want streets, parks, rec center, pool & fire station. Two incumbents re-elected in RISD school board elections. Kris Oliver wins open seat. Voters want more of same from the largest, most diverse "Recognized" district in Texas. Complete election results can be found at the official Dallas County Elections website. The data after the jump is extracted from there. All three Richardson ISD high schools advanced this week in the Texas UIL high school baseball playoffs, each winning game 3 of their 3-game bi-district series against Garland ISD schools. Richardson beat South Garland 5-2, Berkner beat Lakeview Centennial 5-0, and Lake Highlands beat Rowlett 4-0. The area round of the playoffs will be played next weekend. Congratulations to all for continuing to ... Play in May! The Richardson Public Library's Fountain Plaza was the site of a fun and energetic Lion Dance Saturday afternoon. The Chinese Lion Dance is performed for festive occasions. The library was celebrating Asian Pacific American Heritage Month in recognition of Asian and Pacific Islanders in the United States. The photo caption is correct. The photo above was snapped at the Richardson Civic Center. That field of wildflowers is surrounded by busy city offices, streets, a freeway, library, post office and apartments. 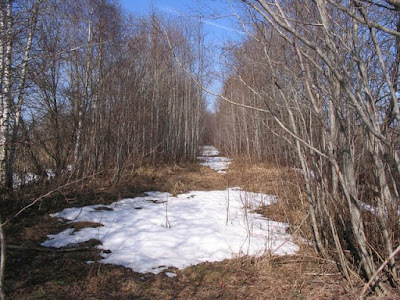 Henry David Thoreau understood that "in Wildness is the preservation of the World." Richardson honors that sentiment with pockets of colorful wildflowers spread around the city every Spring. Richardson doesn't honor wildflowers just by planting them, it wildly celebrates them with an annual "award-winning, multi-day eclectic arts and music festival" called simply Wildflower!, now just one week away. It takes over the Galatyn Park Urban Center from May 14-16. Take the DART Red Line to Galatyn Station. Enjoy live entertainment at one of three outdoor performance stages, along with food tasting, displays and exhibits and plenty of kid's activities. After all, Thoreau's Wildness isn't the only kind of Wildness that's beneficial to the human soul. After the jump, a couple of close-ups of those wildflowers at the civic center. The City of Richardson has a bond election coming up on Saturday -- $66 million for streets and alleys, parks and rec centers, fire stations and neighborhood vitality projects. The "yes" side says we need these things to keep Richardson an attractive place to live, work, shop and play. The "no" side says we only want these items, not need them, and we can't afford them in any case. After the jump, another way to look at the election. 2010 04 01 - Claire: "How could anybody reasonably be expected to distinguish an April Fool's joke from their [D Magazine's] normal content even on 4/1?" 2010 04 01 - Robin Williams calls Australians "English rednecks." Australian PM takes offense. You see, Aussies really hate being called English. 2010 04 01 - The Church's response to revelations of sexual abuse? 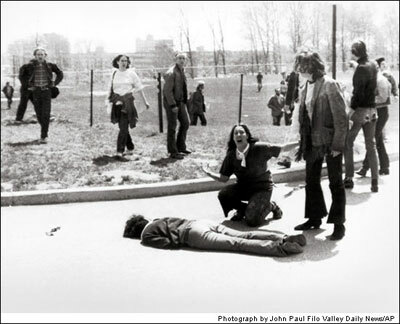 Stonewall. Issue non-denial denials. Attack the messenger. Wrong. Wrong. Wrong. 2010 04 01 - Sarah Palin joins Sierra Club in criticizing Obama's drilling plan. Both are being consistent. SC champions environment. SP opposes Obama. 2010 04 01 - Daily Show on the census: If the gov't doesn't know you exist, how will the black helicopters come to tax your guns to pay for death panels? In case you weren't aware, the City of Richardson is holding a bond election Saturday, May 8. On the ballot are four packages: $24.7 million for street improvements, $22.6 million for parks and recreational facilities, $10.4 million for municipal public buildings, and $8.1 million for neighborhood vitality projects, for a total of $66 million. The Dallas Morning News has recently given some coverage to some sideshows to the bond election. After the jump, I follow the News down the rabbit hole. Sunshine. Art. Music. Food. People. Richardson's Cottonwood Art Festival. It doesn't get any better than this in Richardson. Or in most cities on most days, for that matter. For more photos, click here. Congratulations to the baseball teams from Richardson and Berkner High Schools. The two schools were co-champions of District 9-5A. 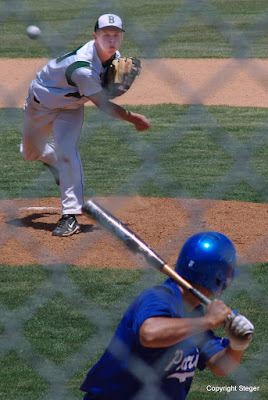 In a one game playoff Saturday afternoon at Richardson High School to determine the top seed for the playoffs, the Richardson Eagles beat the Berkner Rams 6-4 on the strength of three one-run home runs. Friday night, Lake Highlands clinched the fourth and final playoff spot for District 9-5A. Wish all the RISD schools, as well as DISD's W.T. White High School which finished third in District 9-5A, the best of luck going into the playoffs. They've all achieved their goal to "Play in May!"